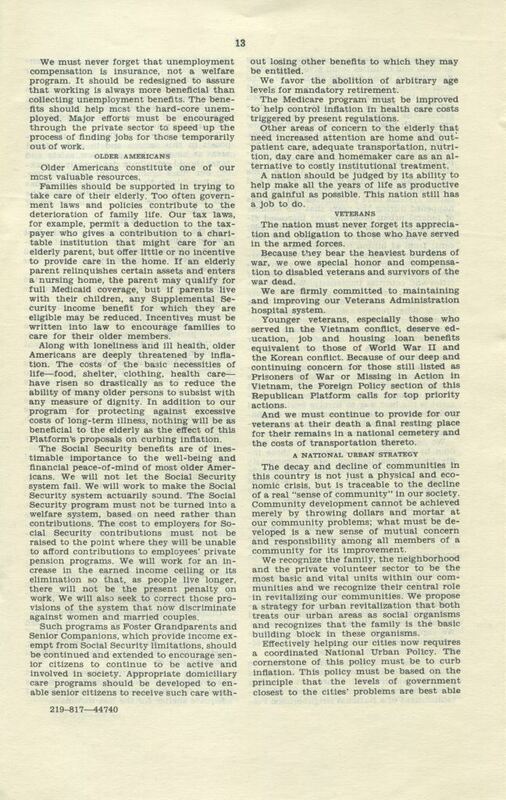 A section of the Congressional Record of the 1976 Republican Party platform, continued from a previous page. This section contains the platform on unemployment insurance, senior citizens, veterans, and urban development. For veterans, he platform references several goals, including the maintenance and improvement of educational benefits for veterans and the Veterans Administration hospital system. Represemtatove Lou Frey, Jr. (1934-) notably took on these projects in his Central Florida district, although not all of his efforts passed through Congress. One of these efforts was the repeated introduction of bills to the U.S. House of Representatives that would establish a VA hospital in Brevard County. Rep. Frey served in the House from 1969 to 1979. Original platform, 1976: Lou Frey Papers, box 11, Lou Frey Institute of Politics & Government, Special Collections and University Archives, University of Central Florida, Orlando, Florida. Digital reproduction of original platform, 1976. Originally published by the Republican Party. Copyright to this resource is held by the Republican Party and is provided here by RICHES of Central Florida for educational purposes only. The nation must never forget its appreciation and obligation to those who have served in the armed forces. Because they bear the heaviest burdens of war, we owe special honor and compensation to disabled veterans and survivors of the war dead. We are firmly committed to maintaining and improving our Veterans Administration hospital system. Younger veterans, especially those who served in the Vietnam conflict, deserve education, job and housing loan benefits equivalent to those of World War II and the Korean conflict. Because of our deep and continuing concern for those still listed as Prisoners of War or Missing in Action in Vietnam, the Foreign Policy section of this Republican Platform calls for top priority actions. And we must continue to provide for our veterans at their death a final resting place for their remains in a national cemetery and the costs of transportation thereto. 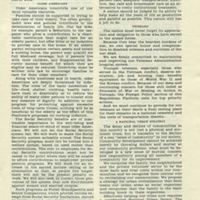 “Republican Party Platform, 1976.” RICHES of Central Florida accessed April 26, 2019, https://richesmi.cah.ucf.edu/omeka/items/show/3661.